You’ve worked hard to make your home an oasis of privacy and safety for your family. Make sure that your landscaping offers protection as well as screening from the outside world. A qualified landscaper can offer you outdoor lighting solutions that will reduce pockets of darkness around your home in Ann Arbor MI. This custom lighting design, specific to your architectural features and plantings, will increase the security level around your house. motion sensor units, which turn on when there is movement near the light fixture itself. Depending on the placement of the light and your household habits, each of these lighting units offers a security benefit. Timed lighting units and daylight sensitive fixtures offer you the surety of knowing that your outdoor security lighting is on whether you’re home or not. Motion sensor lighting units will send an intruder running, but can also become a nuisance if neighborhood cats or other night time animals are triggering the lighting unit. Your family habits can help determine the best lighting design for your situation and security needs. 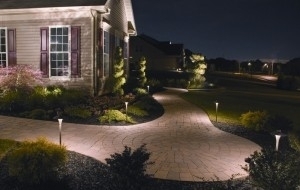 While there are many solar lighting landscaping options available for ambiance and walkway lighting, most of the units found in garden centers and home supply stores are not bright enough to be considered security lighting. However, solar motion sensor lights, properly sited and mounted, can provide you with a bright light in a dark area where power is not easily available. Because these units feature a separate charging panel, you can count on a fully charged light fixture, even in the placement of the lighting unit is in a dim spot. While the charging panel can be mounted to most efficiently catch the sun, the motion sensor is built into the lighting unit. Many of these units can function up to fifteen days after a full charge, so even during the rainy season, your solar security light will function consistently. A conversation with a professional landscaper can provide you with the best mix of solar and wired outdoor lighting solutions. No matter the season, you can be assured of quality security lighting to protect your family and home from unwelcome intrusion. Guidance will also be available on the best treatment of foundation plantings that may have become large enough to give a potential intruder a spot to hide. If you need plantings cut back, removed or replaced in Ann Arbor MI, contact a landscaping professional. A careful review of your home, window placement, current plantings and lighting needs is a great investment in the safety of your family and home.